A Blowing Rock Cabin is the perfect accommodation for your family vacation or mountain getaway. "A Bear's Den" is a Blowing Rock cabin available for vacation rentals. It is conveniently located between Blowing Rock and Boone, North Carolina. Enjoy hiking and biking trails on the nearby Blue Ridge Parkway. We know that your stay in our Blowing Rock cabin will be everything your High Country vacation should be. Kick back in front of our stone fireplace with our new remote controlled gas logs, relax in an oversized garden tub, or take in the fantastic mountain view from the rocking chair front porch. This Blowing Rock Cabin has it all. Local attractions include Appalachian State University, skiing and Tweetsie Railroad. You are sure to enjoy your stay in the beautiful Blue Ridge Mountains. Welcome to A Bear's Den Blowing Rock cabin. 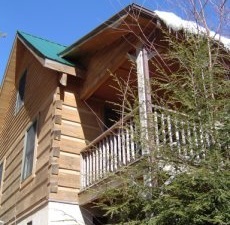 A Bear's Den Blowing Rock Cabin is located at the top of the hill overlooking the Timber Ridge properties. The entrance to the Blue Ridge Parkway is only one half mile from our rental cabin. The towns of Blowing Rock, NC and Boone, NC are each within easy driving distance. The cabin features a paved entry and private driveway for easy accessibility. This Blowing Rock cabin is very kid-friendly, and we allow trained pets for a one-time fee regardless of the length of your stay in Blowing Rock. We have thoroughly enjoyed our log cabin as a home away from home, and we hope you will too. "I just want to thank you for allowing me to rent your cabin and home away from home this past weekend. I had never been to Blowing Rock before and come to find out it's a really neat town. The weekend getaway was just what we needed. I will recommend your rental cabin to my family and friends should they be looking for a weekend getaway. Once again, thank you and God bless! I really appreciate your cooperation!" Stay a weekend, a week, or make a Blowing Rock cabin your home - long term rentals are available by appointment. Ready to make a reservation? Have questions? Check Availability, Email, or call Chad at (704) 258-4665. We are looking forward to hearing from you.